After years of rumors and Instagram teasers, SRAM's wireless Eagle AXS mountain bike drivetrain is finally a real, live thing that will be on the shelves this coming April. 12-speeds, a few batteries and circuit boards, and most notably, no cables or wires to be seen. Instead, you push a button and the shifter tells the derailleur what to do via an encrypted wireless network. 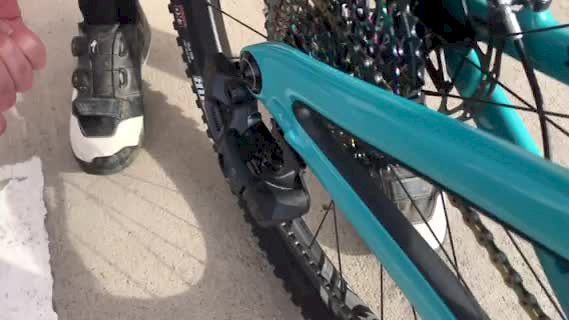 An impressive amount of work and technology went into moving the chain from cog to cog, but all you'll hear is a soft ' vvvvt' sound as it all happens between your feet. #1 - AXS might have debuted a few years ago if Eagle didn't happen. It was only a decade ago that 2x10 drivetrains were supposed to be the way to go, and just six years since SRAM did the 1X thing... which, I'm told, is actually around the same time that they had a prototype 11-speed electronic drivetrain up and running. It was still very early days and the decision was made to put resources towards the mechanical 12-speed Eagle group rather than a wireless system. SRAM says that they kept a small team beavering away on it, but who knows what we'd be riding right now if they had decided to go electronic five or six years ago? #2 - Like all electronic devices, SRAM has to have each and every battery-powered component certified in every country they want to sell AXS parts in. The certifications vary depending on the country and the device's specifics, too. What are there, circuit board police, or something? Not quite, but you may have heard of the FCC (Federal Communications Commission) in the United States that test things like electromagnetic emissions and other science-type stuff. SRAM has a guy whose only job is to certify electronic components in different countries, which often requires ten samples and a six-digit budget. It's also why SRAM went out of their way to make sure the AXS electronics were future-proof and versatile - they don't want to have to re-certify anything. #3 - No, you can't "hack" into your friend's derailleur to lock everything out but the 10-tooth cog, as amusing as that would be. SRAM has built-in some security features to keep your ''buddy'' or pesky Russian hackers from forcing you to high-post down Deadman's hill. To control the derailleur or seatpost's action, you need to have the companion AXS app on your phone synced to it, and in order to do that you have to press and hold a button down on the derailleur or post - you need physical contact in order to pair the devices, and the serial number, too. #4 - The rear derailleur has a built-in gearbox, and I'm not even trying to stir the pot with this one. The tiny electric motor hidden inside the derailleur spins at something like 80,000 RPM, which is neat but also completely useless when it comes to shifting gears because SRAM needed torque, not RPM. So that's where the even tinier gearbox comes in by gearing it down and converting it to torque. The "gearbox" is really just a few very small, very precisely cut gear wheels that SRAM says will last the lifetime of the derailleur.